LITTLE BY LITTLE EVERY DOCTRINE OF THE CHURCH WILL BE CHANGED AFTER “REVIEW” IN THE BERGOLIAN PAPACY, IS DE TRINITATE NEXT??? Goodbye, “Humanae Vitae.” Half a century later, the encyclical against artificial methods of birth control that marked the most dramatic moment of the pontificate of Paul VI, rejected by entire episcopates, contested by countless theologians, disobeyed by myriads of faithful, is now giving way to a radical reinterpretation, to a “paradigm shift” undoubtedly desired and encouraged by Pope Francis himself. His wish becomes command. 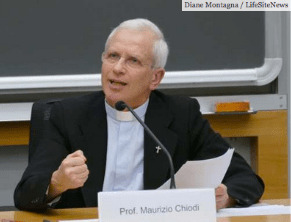 An authoritative guise has now been given to the new interpretive paradigm of “Humanae Vitae,” with an explicit go-ahead for artificial contraception, by one of the pope’s most respected theologians, Maurizio Chiodi, professor of moral theology at the Theological Faculty of Northern Italy and a newly appointed member of the Pontifical Academy for Life, already the author of a book published in 2006, “Etica della vita,” that upheld the legitimacy of artificial procreation. The authoritativeness of his position is confirmed by two connected facts. The first is the context in which Chiodi laid down the new interpretation of “Humanae Vitae”: a conference at the Pontifical Gregorian University on December 14, in the course of a round of meetings dedicated to that encyclical at the fiftieth anniversary of its publication, organized by the university’s faculty of moral theology, directed by the Argentine Jesuit Humberto Miguel Yáñez, a protege of Bergoglio’s. The commentary, as can be seen, ends with a question mark. Which is, however, entirely rhetorical. The ideas Chiodi presents in his conference, in fact, are not hypothetical, but affirmative. There are circumstances – he maintains – that not only allow but “require” other methods, not natural, for birth control. “That to which the practice of ‘natural methods of fertility’ attests is the responsorial character of procreation: these too say that to procreate is not to create. The method, however, attests to more than it can guarantee on its own. It reveals a sense that transcends it. If the responsibility of procreating is that to which these ‘methods’ refer, then one can understand how in situations in which these are impossible or impracticable other forms of responsibility must be found: these ‘circumstances,’ for responsibility, require other methods of birth control. In these cases, ‘technological’ intervention does not deny the responsibility of the procreating relationship, just as moreover a conjugal relationship that observes natural methods is not automatically responsible. “The insistence of the magisterium on natural methods therefore cannot be interpreted as a norm that is an end in itself, nor as mere conformity with the laws of biology, because the norm refers to the good of conjugal responsibility and the physical laws (physis) of infertility are inscribed upon a body of flesh and in human relations that cannot be reduced to biological laws. Moreover, since last spring a study commission set up at the Vatican has already been working to reconstruct the genesis of “Humanae Vitae” from the historical and documentary point of view. Its members are the Monsignors Gilfredo Marengo and Pierangelo Sequeri of the John Paul II Institute, Angelo Maffeis of the Paul VI Institute in Brescia, and the historian Philippe Chenaux of the Pontifical Lateran University. Marengo and Paglia have denied that the work of the commission has to do with the contents of “Humanae Vitae,” much less with a reinterpretation of them. But it is all too clear that the revisitation of the tumultuous path of the that encyclical’s preparation – in which already back then the circles in favor of artificial contraception were stronger and more pressing than those against, espoused by Paul VI – can only benefit the paradigm shift that is underway. 2 Responses to LITTLE BY LITTLE EVERY DOCTRINE OF THE CHURCH WILL BE CHANGED AFTER “REVIEW” IN THE BERGOLIAN PAPACY, IS DE TRINITATE NEXT??? Catholic. They are worse than the Arrians? Died. You most likely will just be Ostracized Socially for awhile. Let the break offs and modernists do thier own weird thing. They go one way, you stay this way. The sheep and wolves are being separated. It’s striking that those ‘circumstances’ can not possibly “require” abstinence. Dante definitely would place in these adulterers of truth into either the eighth or ninth circles of HELL.